There was a time before his personal life, his body, and his game all fell apart that if Tiger Woods went a year with just one win it would have been considered a disappointment. Now, after perhaps the greatest fall of any superstar U.S. athlete, his return in 2018, culminating in his 80th PGA Tour win at the Tour Championship, was a sports story worthy of being documented. 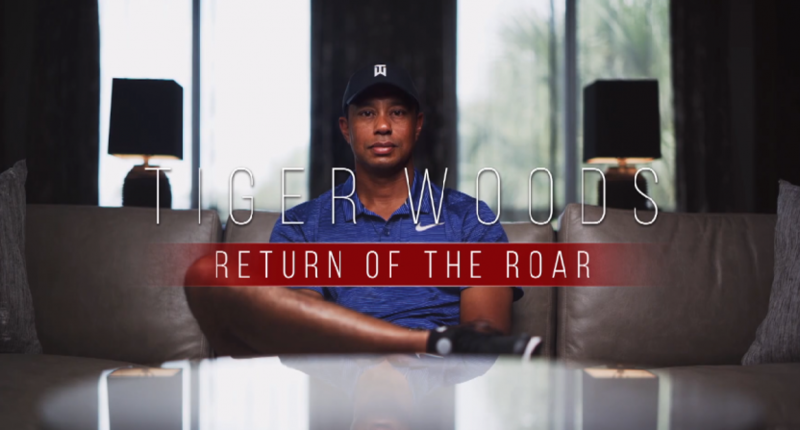 ESPN and the PGA Tour clearly agree as they’ve assembled Return of the Roar, an ESPN documentary on Tiger’s 2018 season, which will feature extensive interviews with Tiger himself. It will debut at 9 p.m. Eastern on December 30th on ESPN. Via ESPN’s release, the film will include appearances by Tiger, his caddy Joey LaCava, and dozens of more players as it recaps the key tournaments from Tiger’s 2o18 comeback. Tiger Woods: Return of the Roar, airing at 9 p.m. ET, chronicles the 2017-18 season that saw Woods overcome career-threatening back surgery to win on the PGA TOUR for the first time in five years. Beginning with his return to competitive golf at the Hero World Challenge in Albany, The Bahamas, in late 2017 and culminating with his stirring victory at the 2018 TOUR Championship in Atlanta – the 80th of his PGA TOUR career – the film captures the season that reenergized the career of arguably the game’s greatest player. With new, never-before-seen content, including multiple interviews with Woods, viewers will get behind-the-scenes access to PGA TOUR events central to Woods’ return, including the Valspar Championship and the TOUR Championship, featuring stylized off-speed cameras and inside-the-ropes viewpoints. Considering how the Ryder Cup and The Match went, it’s probably best that the film cuts off after the Tour Championship triumph. Still, Tiger’s return this year really was something to behold and the scenes at East Lake as crowds spilled into the fairway to follow him to the 18th green are worth reliving. Plus, listening to Tiger run through various key moments from events he didn’t win should also be very entertaining. Tiger is always guarded, but in the right setting and with a focus on golf, he can be very insightful. This being a joint production with the PGA Tour (the film was directed by “PGA Tour Entertainment”) and with Tiger’s obvious cooperation, we’re probably not going to get much insight beyond golf. Fortunately for Tiger, and for golf in general, this was the first year in a long time that Tiger’s exploits on the course are more than enough to make for a watchable film.